This is me (Brett Aquila) in 1993 standing in front of the first truck I ever drove solo. I was parked in my ma's driveway and that's my sister, niece, and nephew alongside. Good times! Ah to reminisce - it's always fun. 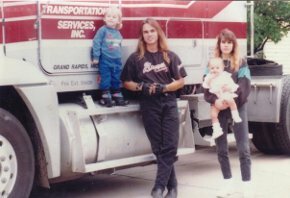 At TruckingTruth we're always helping people that are interested in becoming a truck driver and naturally what most people would like to know is, "What is it like being a truck driver, and what will I have to go through to get there?" When I look back on my days at truck driving school I remember so much of it like it was yesterday. It was incredibly exciting but quite stressful at the same time. You're learning so much, you're getting ready to embark on a new career, and there's so much at stake - your head is spinning the whole time! I thought I'd take a look back on my days in truck driving school and my first truck driving job and let you guys know what it was like. It was 1993. I was 21 years old and I had never even seen the inside of a big rig, let alone ridden in one or driven one. I didn't know the first thing about the trucking industry and I didn't have a single friend or relative that had ever done it. I had done some pizza delivery and driven a small box truck one day for a warehouse I worked at and decided that I was tired of making $5.50/hr in a warehouse and would take a shot at truck driving. I went to a truck driving school in McDonough, Ga, signed up, and was excited as could be! I would be staying in a hotel down the road from the school next to the interstate and it didn't take long to get settled in. Life would never be the same - that much I knew! The first thing they started us on was a week of classroom followed by 3 weeks of splitting time between classroom work and learning to back up a truck out in the yard. I remember the first time I ever climbed into one of the old yard trucks we used. It was a clunky, old, dusty retired tractor, but to me it was just amazing! I remember getting in, looking around, and giggling to myself - "So this is what the inside of a big rig looks like!" I remember letting out the clutch slowly and the tractor eased forward and I thought "I moved a rig! A REAL rig!" I couldn't stop laughin - it was soooo exciting! Learning to back up wasn't too big of a deal. We practiced maneuvering forward around the yard, and backed up around different obstacles. For three weeks we got better and better, but we got more nervous as the time to head out on the road for the first time approached. I remember the first time we ever drove on the highway. I was the first one in our little group to drive, and I remember thinking "I can't believe they're gonna let us take this thing out onto the highway! They're crazy, but I'm soooo glad they're crazy cuz this is great!!!!" I went through the gate, turned onto the two lane road, and started clumsily working my way through the gears. It was working!!!! We were picking up speed and I was really driving a rig!! I was so excited I thought I was going to explode. I remember when it was the next guy's turn I pulled off on the side of the road at a gas station and we got out. I looked down the side of that monsterous warehouse on wheels and thought "I can't believe I just drove this thing! How can that be legal? This can't be legal!" I couldn't believe I was driving something so HUGE! It was truly one of the most amazing feelings I've ever had. Unforgettable! The motel I stayed at was right alongside the interstate. I used to walk to Wendy's restaurant to eat pretty much every day and I had to cross the overpass to get there. I spent many, many hours over that 7 week period watching the trucks roll on down the highway. I wondered what their story was. Where were they headed? How far from home were they? And more than anything I wondered what it felt like to be sitting behind that wheel - a real big rig driver - rollin down the highway and living on the road. Wow - I couldn't wait! I was in la-la land the whole time just daydreaming about the day my chance would come. A few weeks later we had practiced driving and backing and pre-trip inspections until we thought we would throw up. But when it came time to test we really, really thought we were going to throw up! My God we were nervous! I remember getting ready to head out on the road test. I remember smiling to the instructor and talking for a moment, then taking a deep breath knowing that if I could just pass this test I had a real CDL and I was on my way! I passed all my CDL tests the first time and when the testing was finally over I thought I would pass out from relief! I never felt so excited in my life! It was all becoming so real now. I landed a job before we even finished our graduation ceremony and I was getting ready to head out on the road. I remember walking across the parking lot at my new company and seeing my trainer's truck. He was already in there waiting on me and I opened the door and climbed in the passenger side. We introduced ourselves and I asked "So we're really getting ready to head out??? Where we goin???" He said "We're heading to Maryland first, and then hopefully out west." OUT WEST????? As In Cowboys, Indians, Cactus, and Gold????? My God that would be insane!!! I was just freakin! I remember pulling out of the parking lot, turning onto the interstate on ramp, and heading North. I can remember thinking "This is it! I'm officially a real truck driver and we're living on the road!!!" Those days of training and my earliest days on the road were some of the most exciting times of my entire life. I was a real big rig driver, heading out into territories of this beautiful country that I had yet to experience, and I knew my life would be forever changed - and it certainly was! It was breathtaking! Listen, at TruckingTruth we don't sugarcoat the trucking industry and life on the road as a truck driver. We give it to you straight - the good, the bad, and the ugly. I'm certainly never going to imply that trucking is easy, or that it's for everyone - it's certainly not. In fact, it's hard as hell and it's not for most people. But I've gotta tell ya - if you have the right personality and life-goals for trucking, you will find it hard to ever match the excitement and wonder you'll experience when first becoming a truck driver. Heading out onto the highways in that rig - never knowing who you'll meet, never knowing where you'll be going in the coming days, and most of the time you're too busy and excited to ever look back. So if you're in training to become a truck driver or you're considering starting a trucking career, enjoy every minute of it you possibly can. Because no matter how it all turns out someday, the early days of your career will hopefully be filled with wonder, excitement, and awe. There's no doubt that mine were - and those are memories I'll always cherish!